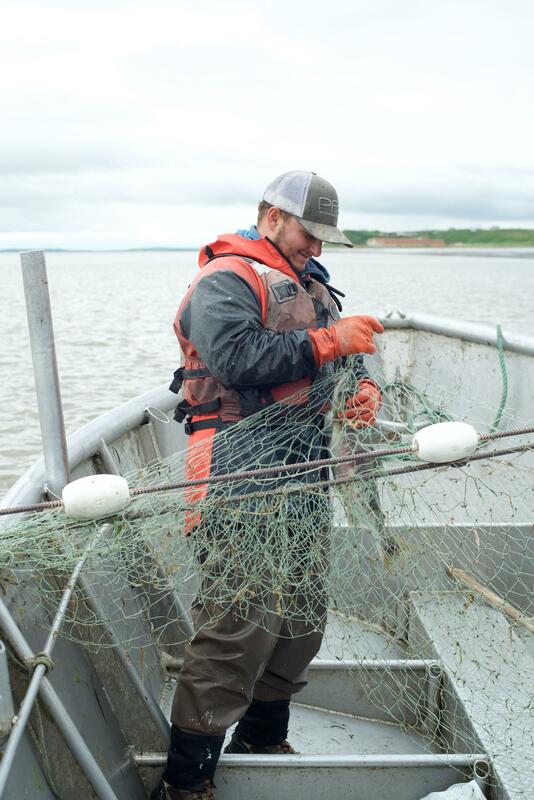 Fishermen in Ugashik Bay are used to their sockeye showing up late in Bristol Bay’s salmon season. This summer though was especially trying, but for some, the wait was worth it. Conrad Day and his crew tow a net into the Ugashik River in preparation for the incoming high tide. Things are quiet out on the water tonight, but a few days ago the river would’ve been full of fellow set netters preparing for the evening sockeye run. Day described what fishing was like at the season’s peak. It is the end of the season, so a lot of people have packed up and headed home, but there still are a few set netters, like Day, fishing. He is a college student at Texas A&M studying nuclear engineering. Set netting has been a great summer job for him the last three years. Every salmon that strikes the net in front of him is little more money towards his education. Even though the salmon are coming in now, for a long time things didn’t look good in Ugashik Bay. It was so bad that Catie Bursch, a set netter who’s fished in Pilot Point for over 30 years, thought the run may have failed. “I was nervous whether they were going to come back or not,” Bursch said. 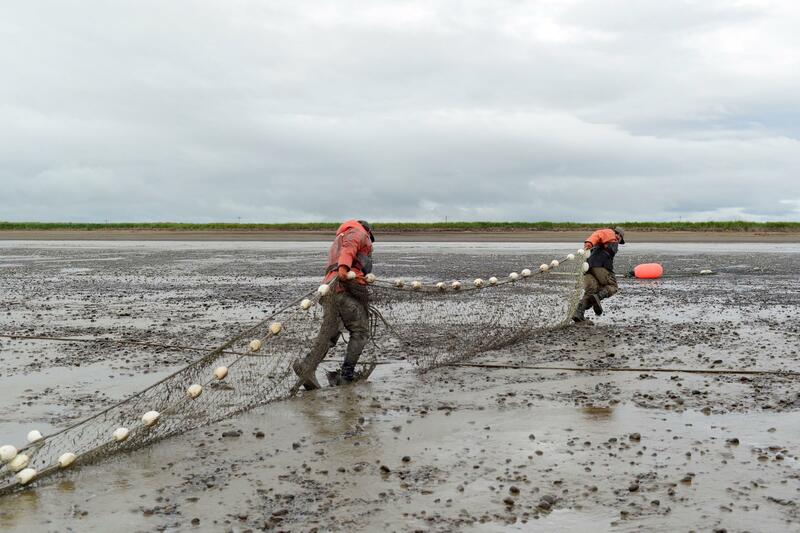 The Ugashik fishing district traditionally has one of the latest runs in Bristol Bay, but this year took it to a whole new level. “We were sitting around and were like ‘can you believe we’ve only been fishing for 10 days?’ It felt like a whole entire salmon season got squeezed into 10 days,” Bursch said. “We went from like 18,000lb to like 60-70,000 pounds in less than a week,” Traveler Terpening agreed. This has been Terpening’s best year ever in Pilot Point. His crew pulled in over 125,000 pounds. The Ugashik district’s run is almost up to four million red salmon. That’s about one million sockeye higher than the area’s average for the last two decades. But the way Terpening sees it, a good season depends on more than the number of salmon returning. And this summer, more than 100 fewer drift boats fished in Ugashik at its peak compared to last year. Terpening says that let plenty of sockeye through to fishermen along the beach. On top of that, there were plenty of buyers for set net sockeye, and fishermen are getting around $1.25 per pound, plus quality bonuses for bled and chilled salmon. That’s up almost 50 cents from two years ago. This year’s late run was a roller coaster ride, but Terpening said that he expects every summer to hold a lot of surprises. Back out on the water, Conrad Day and his crew have just finished picking their nets and are bringing a load a fish out to a tender. This tide’s haul was only around 500 pounds which isn’t a lot, but it adds up. That’s not lost on Day.